The 737-300 isn’t just another 737. It was the breakthrough model for Boeing that would give us the start of the twinjet revolution. And for me, it is a plane I have made a lot of memories on. United 737-300. Photo by Dean Morley. I’ll never forget when I met -300 for the first time – in Orlando, FL back in 1989. She’d already been in service for nearly four years by this point, having joined airline fleets at the very end of December in 1984. United’s 737-300s were factory fresh at this point, with many in the fleet less than a year old. What one noticed off her smaller, older sibling was the brighter & larger image her cabin sported – the enlarged overhead bins, the brighter ceilngs, the special ‘Eau Du Boeing’ scent that most Boeings emitted at the time. Settling into row 7A, seeing the oblong engine on the wing was new and unusual for me; it would become a sight I would see for years to come on many flights. And to a 14 year old, having in-flight audio via those old plastic tube systems was a real treat – something I would not forget as we flew the 2 hour sortie back to Washington/Dulles airport. It was a memorable trip… but not the last. Southwest 737-300. Photo by Bill Wilt. I wouldn’t see -300 again for another while – in fact, nearly six years. She had become the dominant narrowbody at many carriers – including Southwest – as well as being a staple of fleets, she was finding her way into the leasing circuit as well, which is where we’d meet again. IN 1995, the family ventured forth to Las Vegas, NV for my first ‘adult’ trip to Sin City, and it would be Western Pacific who would take us there. WestPac’s upstart was one of the most heralded in the USA at the time – second only to ValuJet as far as publicity (Or is it notoriety?) for the use of the airplanes as flying billboards for many sites and companies. Indeed, the Winter Wonder Plane would take us to the Colorado Springs hub of WestPac, where we connected onto The Stardust – a garishly colored plane with a 30 ft. tall showgirl on the tail… how Vegas could you get??? Western Pacific Simpsons Livery. Photo by Aero Icarus. See more of Western Pacific’s unique liveries. What I did note of WestPac’s operations was that no two planes had the same seats…or even the same seating configuration, all as a result of the leasing of these planes from so many sources. Arriving at COS during this time frame was like seeing a living infomercial of commercial aviation… the banana yellow ‘Simpsons’ jet; the bright purple “Womack’s” jet… the red/blue Rodeo Jet – it was a feast for the eyes that we haven’t seen since. Returning from LAS, we boarded the Broadmoor (For the famous Broadmoor resort in Colorado) and connected to the Colorado Springs jet (Painted by the Chamber of Commerce & a local bank). WestPac would survive another year before fading into the book of failed upstarts of the 90s. I continued to travel in the 90s – though 737s were not part of my flying for the most part. I saw more widebodies (in the form of 777) and plenty of 757s, but their little sibling was still something I passed by more often than not. That is, until 2001. In the wake of the atrocities of 9/11, travel for me became more restricted; a job change along with upheaveal in the industry meant a change of carriers – and it is here where I found LUV on a -300. Following the massive change around me, I chose to take a break by flying to Las Vegas again, but this time by Southwest 737. I’d flown on Southwest before, but only on the older -200 models, missing the -300 by many chance events. But this time -300 and I would make new memories by flying BACKWARDS! Up until 2003, Southwest’s 737-200s, -300s & -500s had aft facing seating in four sections – one forward, two at the wing exits, and one in the rear. Known on some flights to be the ‘party pits’, they were a rarity at this point in aviation as regulations were killing them off (A change to the FAA rules on seat durability ended them at Southwest, sadly.) For me though luck was on my side, and as I boarded our 737-300 to fly BWI-BNA-LAS, I headed to the rear… to the aft party pit on the plane. She still wore her 1984 brown colored seats, but this time, I’d be looking out the window at the ground below facing backwards. See a picture of the Southwest “Party Pit” on Flickr! For those who never got to experience what it was like, you missed out. There is nothing like feeling the force of takeoff while the seatbelt holds you in place on acceleration; seeing the tail behind you looking out the window; and what was the most problematic issue: NO TRAY TABLES! I can say from experience that it’s impossible to hold a cocktail, a snack pack & lunch (I brought my own) while facing backwards and without a tray table! Now landing was definitely more comfortable – as during braking you felt pushed into your seat. It is an experience that I still cherish. And for me, it was the start of the longest period of 737 flying. 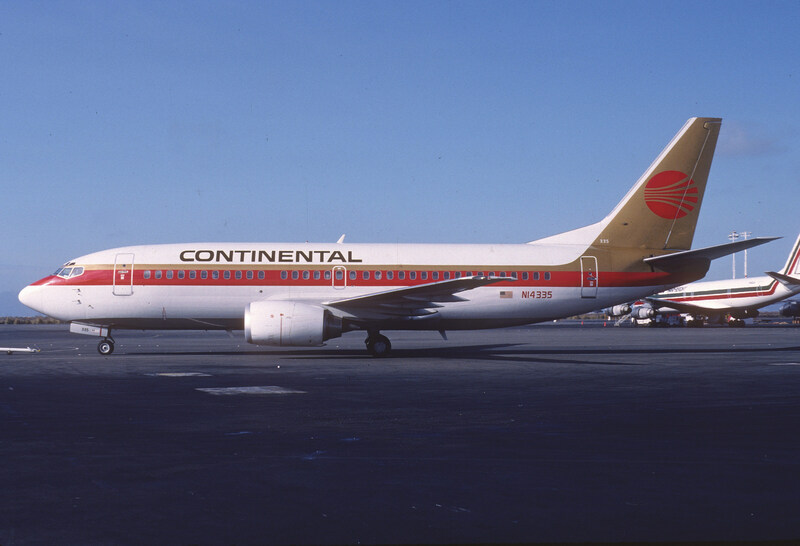 By the early 00s, I’d changed jobs again, and began to jet-commute between Washington/National & Phoenix, AZ – so for my timing & schedule it would be Continental’s Country for nearly seven years. However, -300 was elusive for me there, as by that point they were being drawn down in favor of her newer sisters, the -700 & -800. I would still get to meet her again though, on several segments by luck. Continental Airlines 737-300. Photo by Aero Icarus. But true LUV would be where I had the most amount of time to dance with -300. A relocation to Phoenix in 2010 meant that I’d find LUV again, and a healthy Rapid Rewards account to boot. Commuting to California from PHX meant seeing a LOT of Southwest’s finest – and I got to know and love the -300 more. She always seemed a bit older than her siblings in the fleet, the older interiors a little more worn, but she held a secret that her -700 sisters did not: Only part of the -300 fleet were in the (d)Evolve seating and the rest had the standard configuration from 2002 on. More legroom, more comfortable seats – it was a treat to fly on those beautiful planes. You got a sense that the -300 was there to keep you comfortable, to keep you happy – and that despite the age, she’d get you there every time. And while she lacked some of the newer frills her sister -700s (And later -800s brought forth) she still showed competence in her work. And then, a few years back, it was announced: A FAA rules change would bring a rather swift end to the -300 there at Southwest; plans were drawn up to pull down the entire -300 fleet by the end of September 2017. And gradually at first they began to disappear, replaced by used -700s and new -800s; one by one they made their way to the deserts of Arizona. The plane that made Southwest’s national network possible was beginning to depart. I began to route my trips as best as I possibly could to log -300s into my book, to celebrate her life as best I could with her before she went. You could say I’d fallen in LUV with -300, and that would not be a mistake. And then there was my last time – my last -300 ride. On my way home to Atlanta, I would log my last trip in the -300 before she disappeared from the fleet, from Dallas/Love to Atlanta. While she sported the (d)Evolve seating, it was still a trip I would celebrate with her – as my way of saying goodbye to this wonderous plane. Armed with camera, video equipment, and a beautiful smile, I cataloged as much about her as I could for memory – from the banal of the galleys to the lavatories, to every facet this beautiful plane produced. And as we passed over the state of Alabama, I gave her a cocktail toast – to remember her one last time – a plane that brought me so many beautiful and wonderful memories. And as we descended into the final approach of ATL’s runway network, I shed a tear for her, for this machine that made so much possible for so many people. I thought about the people this plane brought together over the years, for joy, for sadness, for the birth of a new family member, to the passing of another. The people who worked on -300, the people who started new lives by boarding her, to the ones who were going on to make their best memories on her. Most people think of a plane as just an object of transportation, forgetting that they do have souls, personalities & for that matter lives of their own. Each one tells their story – and I am thankful to -300 for letting me be a part of hers. And she will go down in my history too as being a memory maker, a plane that added so much to my own life as not just another model of jet, but of a memory maker in her own right. December 17, 1984 – September 30th 2017. With a whole lotta LUV for you – may you fly on in all our memories. Previous articleInfo, Highlights and How Much Fun We Had In Our First Live Q&A… Your Questions Answered. In Case You Missed It! RD has been involved with the airline industry for over 20 years and is an active travel consultant and airline analyst. R.D. is also a huge #Avgeek and theme park enthusiast.